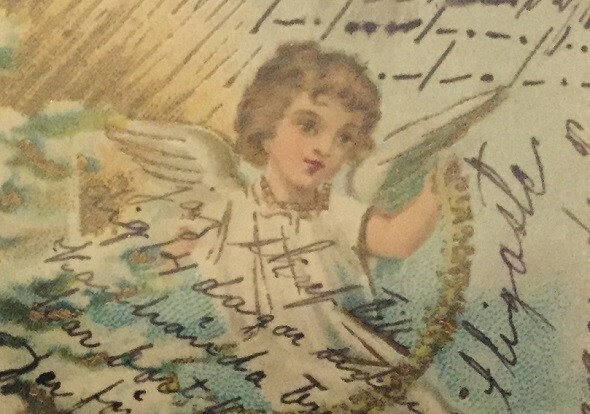 Who can solve this encrypted postcard from Christmas 1906? Klausis Krypto Kolumne wishes everybody a Merry Christmas! 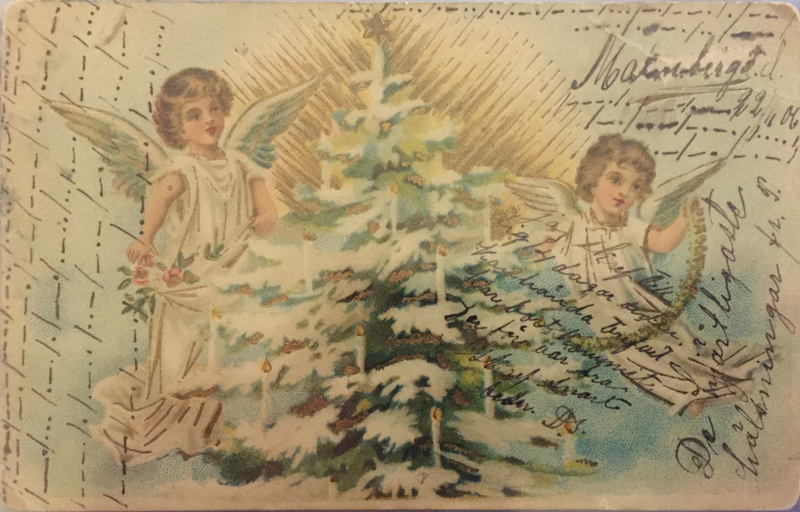 In case you find some spare time over the holidays, try to solve this encrypted Christmas card from the early 20th century. When I attended the Charlotte International Cryptologic Symposium in March this year, I got to know crypto postcard collector Raymond Borges. He let me take pictures of his marvelleous collection. Meanwhile I have published a number of blog posts about these cards. My readers were very successful in solving them. A part of the text is in the clear. It looks like a Scandinavian language to me. On the upper right side the date 22/12/06 can be seen. Unfortunately, the address side of the card is not available. Can a reader decrypt this card? And can somebody read the cleartext? The solution would be a nice Christmas gift for me. Further reading: Who can break these encrypted telegrams from 1876? Es scheint schwedisch zu sein ! PS: Ich wünsche auch allen ein frohes Weihnachtsfest ! “jag skrev […] 4 dagar” – ich schrieb […] 4 Tagen […]” ist eindeutig Schwedisch. 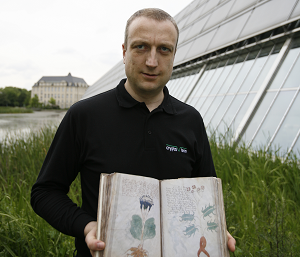 Wenn’s nur leserlicher wäre, besonders das anscheinend getrennte Wort zwischen “skrev” und “4”. Jag skref (=skrev?) till dig 14 dagar sedan. Ich schrieb Ihnen/Dir vor 14 Tagen. Entweder ich stehe auf dem Schlauch, oder der Morsecode ist nicht der heute gebräuchliche. Wohl entweder ein älteres System oder sogar ein Geheimcode zwischen Sender und Empfänger? Wie herum ist der Teil links geschrieben? Ich nehme an, der linke Postkartenrand ist “oben”, aber vielleicht ist es anders herum? Frohe Weihnachten an alle! I wish all of you a Merry Christmas! It’s Swedish alright (old orthography, hence ‘skref’ instead of ‘skrev’ for “wrote”), and the morse dots and dashes should be read backwards from the bottom up. The part on the left edge then reads: “Hwad är orsak df[u] ej skrif ner saar [svar?] som jag skref fjor[ton]…” – or, “what is the cause [that] you haven’t written down reply[? ], which I wrote four[teen] … [days ago?]”. The part on the top isn’t very clear, “Kan hä[n]da o[?] ej 22/11 06 [blurry word in plaintext followed by a ‘d’] u [=du] irl mewa [mera?] skrifua”. “Perhaps [the single ‘o’ doesn’t make sense] not [on] November 22nd, 1906 … you don’t [want to?] write anymore?”. The plaintext parts translates to: “The warmest greetings from P.” and “I wrote to you a fortnight ago. Perhaps the letter has been lost in transit? Therefore it would be good [if you] wrote soon, begs D.S.”. “D.S.” is a common abbreviation in Swedish letterwriting, meaning “the same” (as the one signing the letter). Thank you very much! This solution is a great Christmas gift! Could the dubious word in the upper right corner be a compound: something (Ma…) plus hyphen plus “brigad”? I have to admit that I rather read “birgad” (strictly speaking “birgd” with a later correction to “birgad”).